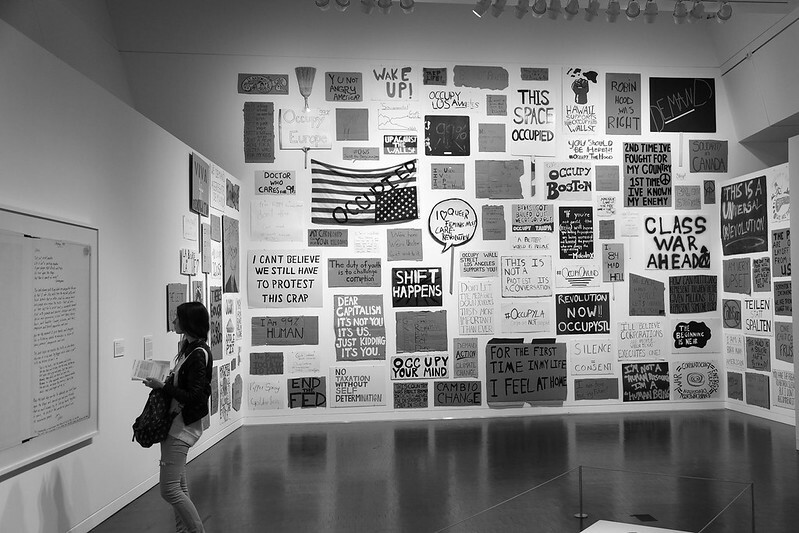 You are currently browsing the Carpe DMM blog archives for March, 2014. We rose sleepily this morning and realised we didn’t have enough Grape Nuts left for breakfast. So we got rugged up and ventured forth into the rainy morning to go to Walgreens and buy some more. That taken care of, we decided we would make the most of the wet weather by catching a bus first to Cow Hollow and the Union Street shops there, then moving on to the Haight-Ashbury area to look around there. We considered an option to extend the day’s travels by walking over to Golden Gate Park and checking out the Conservatory of Flowers, but we didn’t have enough time before it closed in the afternoon. We took a 45 bus from Stockton Street, which took us up through Chinatown on Stockton, which was something I’d never seem before. I’ve always gone through Chinatown on Grant Avenue, but one block over on Stockton was a much different experience. Instead of the restaurants and touristy shops, it was full of Chinese grocery markets and fresh fruit and vegetables. Basically it looked like a more “real” area than one dollied up for tourists. The bus turned on to Union Street and crossed the busy Van Ness into an area of San Francisco I’d never been to before. 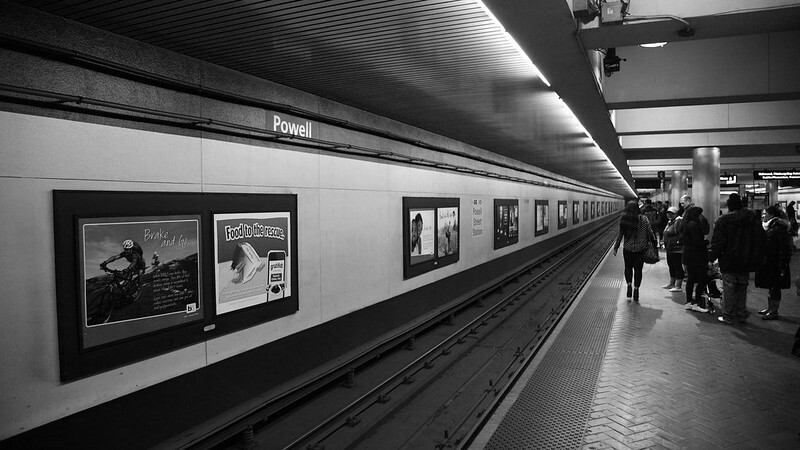 We got off near Octavia Street, where the Cow Hollow shops began. We walked down one side of the street for about five or six blocks until the shops ended, then returned on the other side. We stopped in at a nice old fashioned cafe called Coffee Roasters, where M. had a coffee and we got an oaty slice and biscuit to keep us going until lunch. Both were sweet with fruit and honey, and very yummy. We popped in at various shops that took M.’s fancy. There were little boutiques and knick-knack shops full of all sorts of bric-a-brac. One had cool steel dice, about three centimetres across, though they were way too heavy to be practical – they would dent or smash any table you rolled them on – clearly they were meant only as decorations. In between we braved various intensities of rain and wind, though it never got really heavy, and was more a nuisance than anything else. We finished Cow Hollow a bit after 13:00 and then walked north a few blocks to Lombard Street, where we could pick up a 43 bus to Haight Street. We were waiting in the slightly heavy rain when M. saw a 43 turn onto Lombard from a side street just past the bus stop where we were waiting! We scrambled up the street to the next stop, but had to wait for the next bus to come along once we got there. Thankfully that didn’t take too long, and we sat for the ride south to Haight Street. I’d planned to get off after the bus had turned on to Haight, but as we arrived and were about to turn the bus stopped to let someone else off and we spotted several cool looking shops on that corner, so we scrambled to get off the bus as well. The closest shop was Jammin’ on Haight, which was amazing. 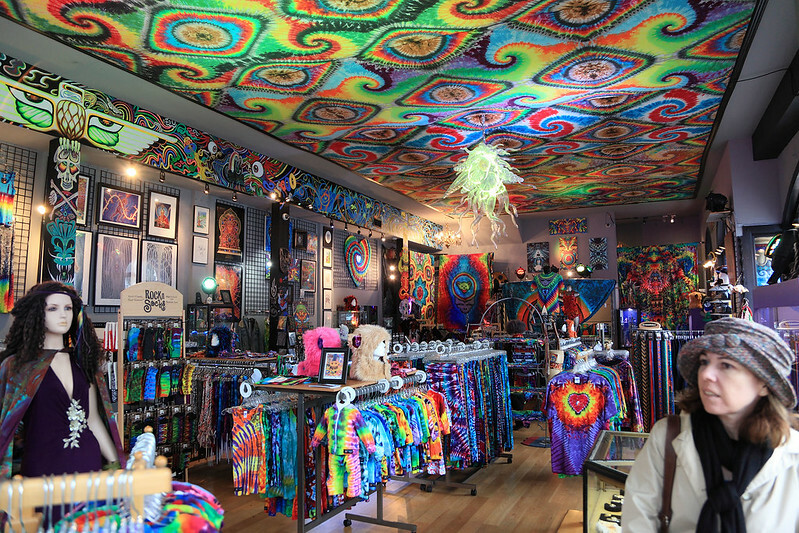 It was like stepping into the 1960s, with psychedelic tie-dyed clothing of all colours and descriptions. What’s more, they had 20% off all T-shirts. I looked through the racks, which were sorted by predominant colour, and found several that were very cool. But one caught my eye as soon as I saw it, with a neat tie-dyed turtle design on it, amidst a sea of psychedelic colour. As I held it up to look at it, a shop assistant said that that was very rare – it had been designed specially for the Grateful Dead, but never released because one of the band members died just before they were about to be sold. They were hidden away, and they found a box of them recently, and now this shop had about ten of them to sell. It was priced almost twice as much as the other T-shirts, but it was clearly the stand out design of them all. I tried it on for size and it was perfect, so I bought it. As we were paying, a second assistant at the counter started telling us the same story about the Grateful Dead, and we said the other woman had already told us! But cool… it’s neat to have such a great shirt with such a great story behind it. We walked slowly up Haight, towards then past Ashbury Street, again stopping in at any shops that looked interesting. We saw the Loved to Death shop, where Kari Byron shops as shown on the Oddities TV show – it was slightly creepy but very cool. And we went into a soda shop called The Fizzary that boasted over 900 flavours of soda. 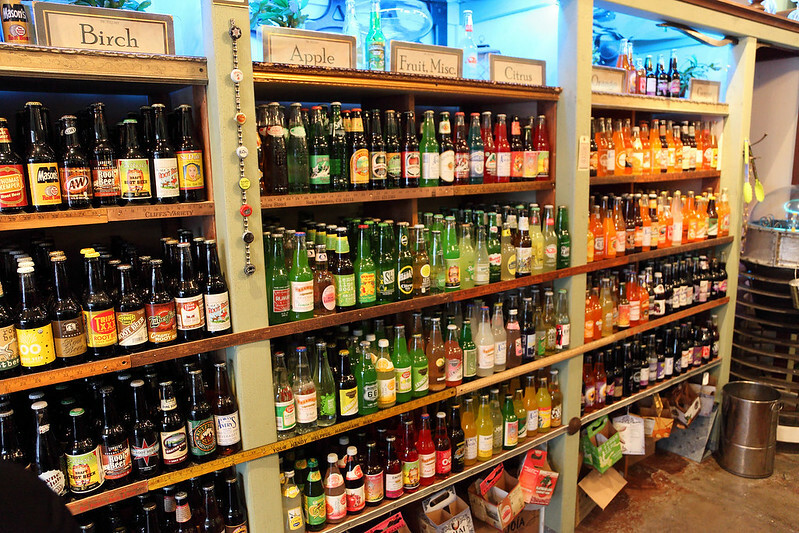 The bottles were arranged on shelves sorted by flavour: root beer, sassafras, birch beer, lemon, orange, cherry, other berries, other fruit, colas, energy drinks, exotic and unusual, and “uncategorisable”. These latters included such things as maple bacon soda, coffee cola, and other weird stuff. They had some imported varieties, but most of it was American. I asked them if they had any passionfruit, and they said there was one from Hawaii, but they didn’t have any in stock at the moment. I also asked how long the place had been there, because the decor looked like it must have been around since the 1950s or earlier, and the guy said they only opened two months ago! I said they’d done a really good job of decorating the place then! Over 900 soda flavours in The Fizzary. But no passionfruit. After looking in a book shop we ended our return traverse of the street and went to the nearest bus stop to catch a 71 back towards and along Market Street, completing our triangular trip for the day. By this time it was after 16:30, and the rain was still tumbling down. On the way back from Market Street to our hotel, we stopped in at the Giants Dugout store on Geary Street to book tickets for a tour of the baseball park on Thursday morning. We booked a 10:30 tour, but when I went to pay, their system didn’t like the foreign Visa card, so I dashed around the block to an ATM and got enough cash to pay for it. Then we went back to our hotel for a while and decided what to do for dinner. I searched the net for some place nearby that did a vegetarian burger. One recommended place I found was Roam, in Cow Hollow, which we must have walked right past earlier today! But I eventually found Burger Bar, at the top of Macy’s on Union Square, just a short walk away. We put our coats back on and braved the rain once again to head there. We got a small booth in a secluded spot and perused the daunting menu. I got a local 8 Ball dark porter ale, then chose a buffalo burger with extra mushrooms and peppercorn sauce. M. picked the veggie burger with no additions, and we got some sweet potato fries to share. It was all pretty good. We had decided to go upstairs to the Cheesecake Factory for dessert, but when we got there there was a one hour wait for a table, so we ditched that idea and just came home. 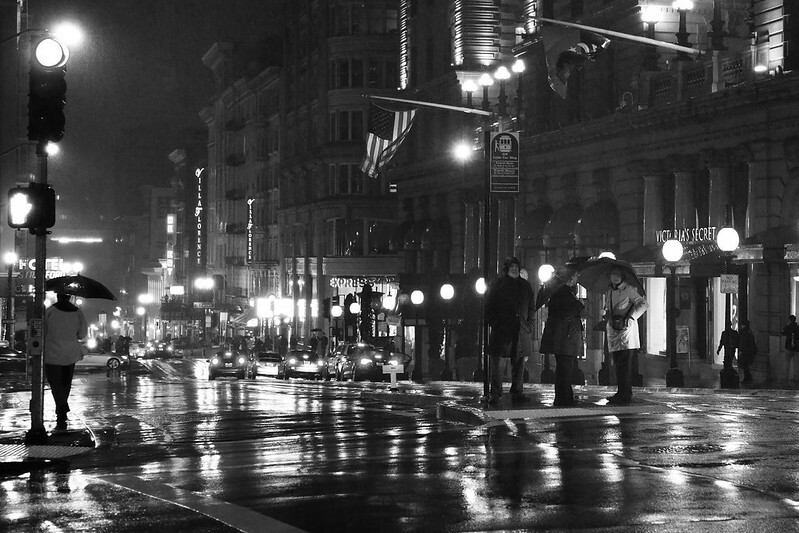 I shot some photos of the rainy streets as we walked, and I hope some of them turn out well. The morning ritual was as usual, and I left at 08:15 to get to the first conference talk at 8:30, which was a plenary session about “integrated imaging”, or designing camera hardware and image processing algorithms jointly, instead of optimising each separately. There were also the best paper awards handed out during this session. The afternoon sessions of the conference were interesting, with one on HDR imaging which was very good. The last talk ended at 17:20, and then I came back to the hotel where M. was waiting. A bit later we went out for dinner, deciding to walk up to Fisherman’s Wharf for seafood. When we got outside, it was sprinkling so we dashed back inside to get our umbrellas. The walk through the light rain was nice, with the streets slick and reflective by the time we got to the wharf. To pick a restaurant from the row of seafood places there, I looked at the signs above them, ignoring the gaudy new neon and choosing the oldest looking painted sign, which belonged to Nick’s Lighthouse. A guy ushered us in and we got a table in one of the booths of which the seating was entirely comprised. Almost all the others were also full already. We thought about dessert, but the waiter said they only had three choices: chocolate cake, cheesecake, or tiramisu. When we looked dubious, he asked what I liked. M. said “ice cream”, and he said to go across the street and find the gelato place. Or go to North Beach and find Stella’s for Italian baked sweets. We’d seen a bakery there on Columbus Avenue on the way, with lots of pastries in the window, and M. asked if that was the one. The waiter said no, don’t go there, it looks good but looks are deceiving. Stella’s is on the other side of Columbus, right opposite, and is much better! 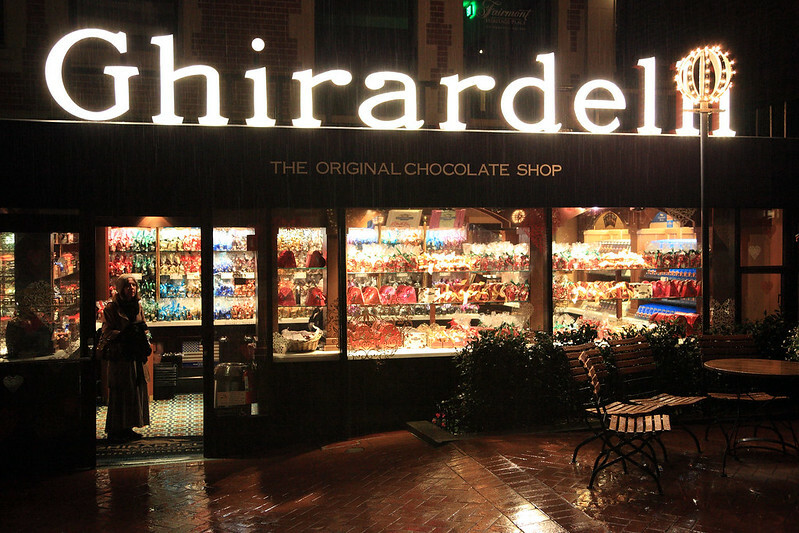 Or, he said, go to Ghirardelli Square and get a sundae. 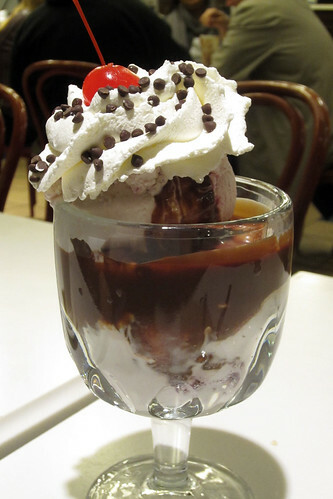 It was cherry ice cream with chocolate fudge sauce and whipped cream, and also delicious. M. settled for a “small” hot chocolate, which came in a tall mug that would have been called an extra large anywhere else. In the dining room there they have a display showing chocolate being made, mixed, and conched in huge copper vats. Enormous amounts of rich molten chocolate being stirred and releasing its aroma into the room. We are relaxing for the evening after an early dinner tonight. We got up again at 07:30, and I got ready to go to the conference. I had slept better, but not great, and was tired. I also wanted to go over my conference talk, which I was due to give at 11:20 this morning. So I skipped the first session of the conference, which was a conference-wide plenary talk on functional MRI and the human vision system. Instead I sat in a rest area near the conference rooms and went over my talk, then had an apple before going in for my session. There were three talks before mine and two after. M. wanted to see me give my talk, so she popped in at about 11:15 and stood near the back. There were about 100 people in the audience, with several standing at the back. My talk began on time and went reasonably well, but I left only a short time at the end for a couple of questions. They were straightforward, and then I sat down and watched the next two talks. M. left for the hotel lobby to read a bit, where I met her after the session finished and I had a short chat with some people who were interested in my talk. We walked towards the Alexander Book Company store on 2nd St, stopping for lunch along the way at a Boudin’s Bakery. M. asked if they could do a grilled cheese sandwich, and the woman said no, but the Boudin’s in the basement of Macy’s would do that, and it was right next door! So we went in there and sat down for lunch. M. had the “great grilled” sandwich on sourdough, while I had a chicken and pesto sandwich on a baguette. They both came with salads. 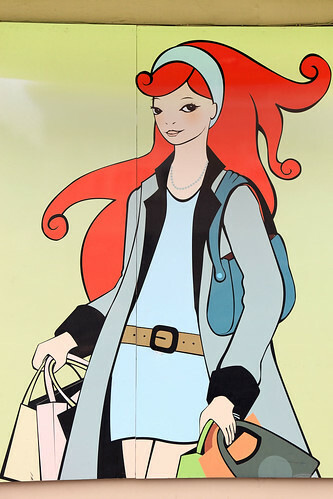 M. said that in the morning she explored Niemann Marcus, which was filled with designer fashions and was very upmarket. The staff were friendly but very prim and proper. They even had a fur room! That was all she had time for before coming to see my talk. 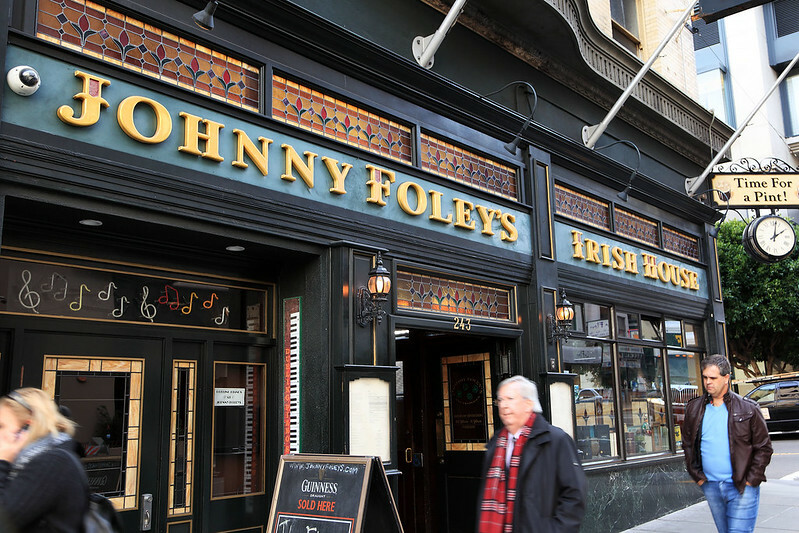 Irish pub near the Hilton Hotel conference venue. After lunch we walked to Alexander Books, where I left M. as I had to get back for the afternoon conference session. The talks were about the digital camera image processing pipeline and also an interesting talk about a new type of sensor chip design being developed in Italy, where each pixel is sensitive to different coloured light depending on the bias voltage. This was theoretical models in 2011 when I first attended this conference, but now they have fabricated a prototype chip to show that it works and measured various properties of it. After the tea break was a panel discussion on the question of “What’s necessary to make mobile cameras the only cameras we use?” There were four panellists. The first was David Cardinal, a professional photographer who showed some of his shots and said you simply couldn’t do them with a phone camera with current technology – you need longer lenses, faster shutter speeds, better autofocus, better response times, better low light performance. That’s what is needed, he concluded. Another panellist said that the question was already moot, phone cameras already are the only cameras 99% of people use! It was a lively discussion and there were a lot of interesting points made. Sabine Süsstrunk said the frustrating thing about phone cameras – and here she showed pictures of an Apple, Nokia, and Samsung – was that the camera lens was smaller than the logo! She said they should cover the entire back of the phone with lenses and flashes, which would give you decent light collecting power and light projecting power, which you could then combine computationally to get a much better image than current phones. The basic message everyone agreed on is that you simply have to increase the photon collecting area before phones can really compete with SLR image quality. One of the panellists said that despite this, 99% of people are happy with camera phones, because they (a) don’t want to lug around a separate camera and (b) they really don’t care that much about image quality. He said t he thing that will save SLRs is having apps on them. If you open them up to third party app developers, people will go nuts with the things they can do with a high quality camera that you can’t do with a phone. But Nikon and Canon are too closed shop to do this. Some other manufacturer will do it first, and that will be the end of Nikon and Canon, because the market won’t support that many manufacturers. At the end of this discussion, they held a lucky draw for people who had put their business cards into a bowl during the talks. They drew out a few people to win Amazon gift vouchers. Francisco got the first one, and I also won one! Then I headed back over to our hotel to meet M. in our room. 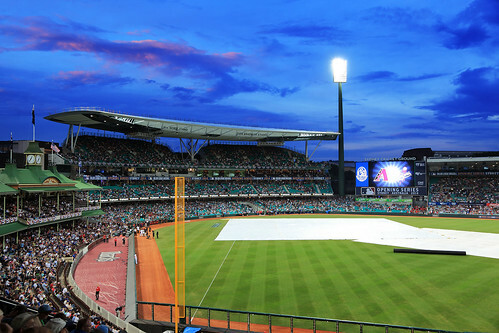 She had used the afternoon to check out Barney’s, where she said the staff were snobby, and a shoe warehouse place, and to pick up the Giants T-shirt we’d ordered in at the fan store the other day. Cherry Garcia for my dessert. Yum! Then it was back for an early night in to rest, type up this diary, shower, and read before bed. On Monday morning we woke at 7:30 again, although I didn’t get very much sleep. We had cereal and milk for breakfast in the hotel room. I left to get to the Hilton by 8:50 for the first talk in my conference track, while M. stayed in the room a bit longer before venturing out to check out Macy’s, which wouldn’t open until 10:00. She actually went out earlier to get some coffee from one of the many Starbucks scattered around the streets. The digital photography conference track started with a mix of papers on hardware and algorithms for various things, in particular some focused on mobile imaging (i.e. with a phone), and there were papers on image quality measurement, glass and polymer microlens designs, and other things. I had an apple from the hotel lobby fruit bowl during the morning tea break, then went out at lunch to meet M. at the front of the Macy’s building on Union Square. We walked down Market St to a Noah’s Bagels place like the one we went to yesterday, and had some bagels again for lunch. This time M. had a nine grain bagel with cream cheese, and then picked a potato and peppercorn bagel to try, curious about the potato, but not realising the peppercorns would make it very spicy. I had smoked salmon, cream cheese, and salad on my poppy seed bagel, which came with potato salad again. Done with lunch, I still had an hour to kill before the afternoon conference session, so we popped in at Jeffrey’s Toys and Comics to look around. It was mostly children’s toys, with a small comic section and a small section of more advanced games. They had Magic the Gathering cards, but only single booster packs. I asked if they knew where I could get boxes, and the guy didn’t really seem to know, pointing me at Walgreens or Target. I left M. at Macy’s again and went back to the conference for the afternoon session. After the tea break, I switched conference tracks since the digital photography track wasn’t so interesting, and went to the human vision track, where they had talks about the interaction of sound and vision in 3D cinema, a statistical analysis of how movie genre affects the perception of the balance between audio and video quality, and a talk by Harry Mathias, a movie maker who was nominated for an Academy Award in the 1980s, talking about modern digital technology and why almost none of it was of any use to “real” movie makers. He came across as a bit of an old fogey who hated newfangled stuff, but he made some interesting and valid points about the intersections of artistic vision and technical requirements. At the end of the talks, I went to the Hilton lobby, where M. was, and we went together into the conference 3D cinema event, which was two hours of 3D shorts from around the world. We only stayed for the first hour, before leaving to go to La Fusion restaurant for the arranged dinner with several other people from Canon. We got the wrong street and found the restaurant a few minutes late, when most of the others were already there. There was Geoff and Quan from Sydney, Francisco (with his wife and young daughter), Su-Kei, and Sandra from Canon USA, a Japanese guy who had been with them for six months and his wife Keiko, and a few other people from Canon Japan who I didn’t know. The food was Peruvian fusion stuff, and very good. It started with two different ceviches, a prawn one and a fish one, and a rocket and beetroot salad. Then came empanadas: beef, fish, and corn and cheese. And for the mains were a fish pot pie (deconstructed onto a plate for sharing), rotisserie chicken (deliciously moist) with a bread salad, and lomo soltado. They made M. a special vegetarian pie with spinach and mushrooms. It was all delicious. Then we had a three layer chocolate mousse cake for dessert, which was presented to Francisco for his birthday, with candles on. Apparently Sandra had bought it earlier and brought it along. We left the restaurant just before 22:30 and walked back to our hotel, where we showered and read for a bit before going to sleep. The alarm woke us this morning at 07:30. M. slept well, but I had a very restless night. Nevertheless, we ate some Grape Nuts for breakfast and then rugged up for a bleak and wet day outside. It was cold and grey and rainy, so we put on all our layers. Despite this, it was very chilly and miserably damp as we walked down to Market St and then the Ferry Building to get a Blue Bottle coffee for M. The wind howled through the streets and made it very uncomfortable, but thankfully the rain was not too heavy. At the Ferry Building we sheltered inside for a while as M. drank her morning coffee. She also got me a hot chocolate, which was nice and warming. We sat looking through the windows out to a windswept bay, with whitecaps spraying foam in the middle distance. I’ve never seen it look so miserable out there. We also saw some enormous seagulls, at least twice as big as the ones back home. After finishing our drinks we browsed in the book shop there for a few minutes before leaving. 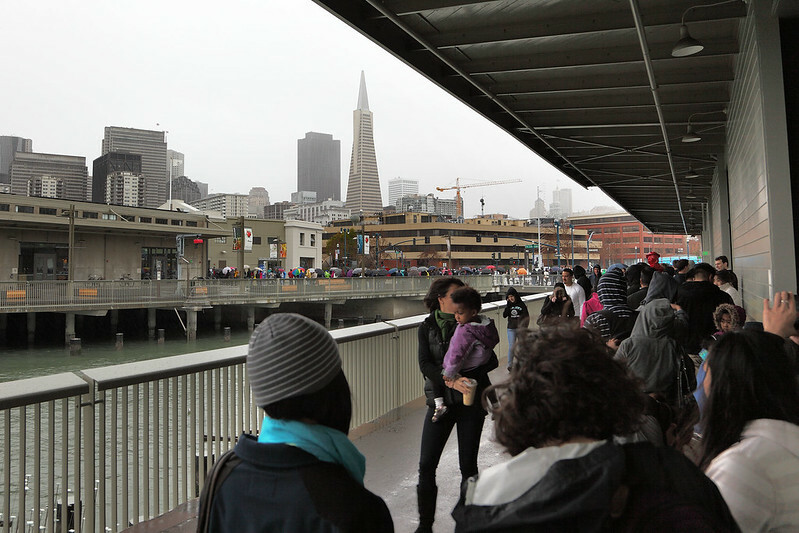 We’d originally planned to take a ferry to Sausalito today, but the weather made us switch to an indoor plan, and we walked up the Embarcadero to the new Exploratorium at Pier 15. We got there just before opening time at 10:00, hoping to get in out of the rain quickly. But when we arrived, we were stunned to see a queue of people about 60 or 70 metres long snaking out across the exposed waterfront to the adjacent pier, then out along that pier a distance. We hurried out to the end of the queue, which was thankfully in the shelter of an overhanging roof, so we could close our umbrellas. But we didn’t relish the thought of the queue advancing slowly, leaving us in the exposed section for several minutes. The queue to get into the Exploratorium. The queue runs right across the middle of the photo (all the people with umbrellas), then towards the camera. At 10:00 the doors opened and the queue moved into the museum fairly quickly. We advanced in steps to the end of the covered area and braced ourselves for the crossing of the unsheltered part. But we were fortunate as the queue moved very quickly after that. 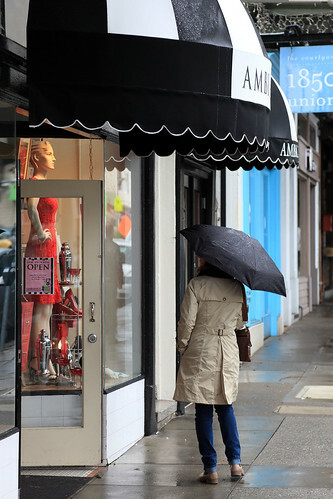 We almost didn’t stop in the open, moving quickly into the building and thankfully putting down our umbrellas again. Inside the building the queue was still about 20 metres to the ticket sale counters, but this moved fairly rapidly too. We only discovered the reason when we went to pay and the guy at the counter just gave us two tickets and said it was free entry today! We dropped our outer layers and umbrellas in a locker then went inside to explore. The place was already busy with people, with lots of kids running around and trying all of the interactive exhibits. It was a little tricky getting a go at some of them, but with a little patience we managed to have a look at most things. Highlights included a giant virtual image mirror, which made it look as though you could touch a copy of yourself floating upside down, projected a few metres in front of the mirror. This was very popular, with several people constantly standing in front of it and gawking. There were also numerous other optical devices and illusions, perceptual illusions, magnetic and electric demos, fluid dynamics, chaotic pendulums, things that made noise or played with your hearing, and a section full of biological displays including lots of microscopes aimed at interesting micro-organisms or cells or other things. There was so much to see and do that even with hundreds of other people crowding the place we could always find an unattended exhibit to play with, or one we could have a go at with just a short wait. I think we managed to try more than half of them – trying them all would require a full day and some very good luck with some of the most popular ones. 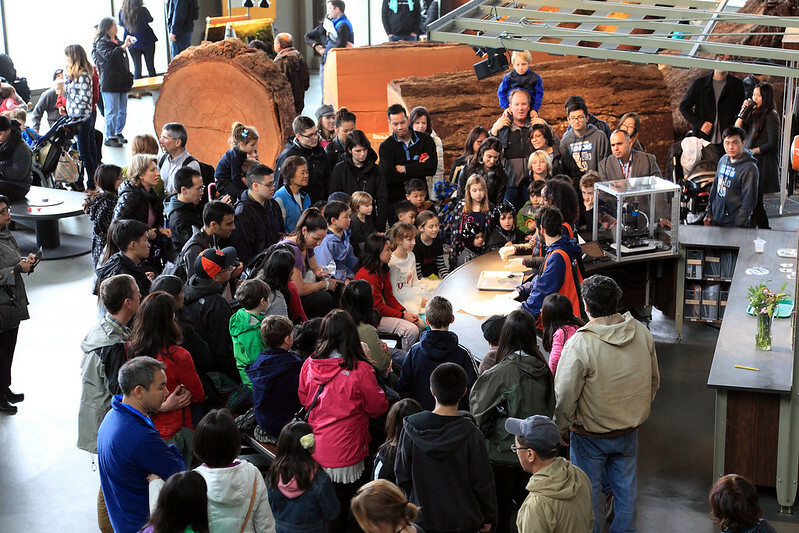 Exploratorium staff dissect a cow’s eyeball in front of curious kids. As it was, we didn’t notice the time passing until it was almost 14:00, at which point we suddenly got hungry for our overdue lunch. We quickly walked past a section or two of exhibits we hadn’t seen yet, stopping at a few to try them out along the way. Then we looked in the museum shop quickly, and by about 14:30 we headed out and back down towards the Ferry Building, where we turned on to Market St and the Noah’s New York Bagels place we’d seen earlier, to get some lunch. Fortunately the rain had stopped by now and the cloud was breaking up a little, but it was still chilly and a little windy. M. had a pumpernickel bagel with cream cheese and a blueberry bagel, while I had a pumpernickel bagel sandwich with pastrami, salad, and mustard. It was good and satisfying after the long time since breakfast. Then we walked back down Market St again and past Union Square and Macy’s to find the Hilton Hotel, where the conference will be this week. On the way we stopped in at the San Francisco Giants Dugout merchandise shop on Geary St, where M. bought a long sleeved Giants T-shirt. There was also one I wanted, but they didn’t have my size, so the guy phoned the baseball park store and is getting one sent over, which we can pick up on Tuesday afternoon. Heading from there to the Hilton we got a bit confused until we finally located it, then got turned around inside the maze inside as I sought the conference rooms to find the registration desk. Having received my registration package, we left again and returned to our hotel. We rested for a while until it was time to go out for dinner. 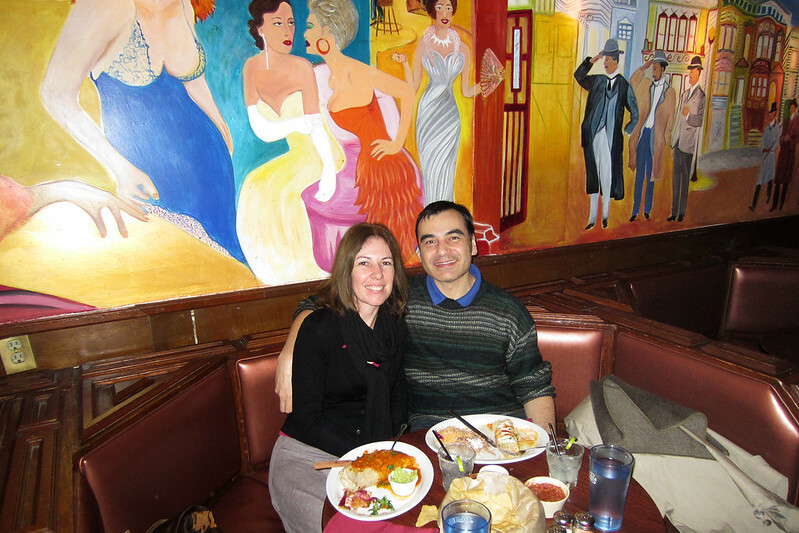 We decided to try Italian tonight, and walked through Chinatown to North Beach. We found a place called Calzone’s on Columbus Avenue, which had been packed yesterday as we walked past and which M. liked the look of. We got a table inside, at a booth, and ordered some garlic bread and a calzone each, Mediterranean for M., which had eggplant, spinach, and cheese, while I had a Philly cheesesteak one. We also got a glass of wine each, Chianti for M. and a Zinfandel for me. The food was reasonably good, but the decor was very cool, with lots of bottles and strings of garlic hanging up everywhere over red painted walls. They had a liquorice cheesecake for dessert, which I had to try, and that was very good, with a strong liquorice flavour. 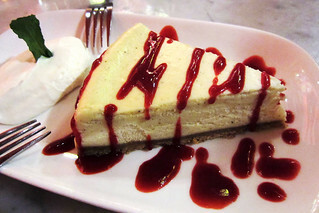 It came with a minted mascarpone cream, which added a good element, and dripped with raspberry sauce, which was a bit discordant. But overall a good meal. 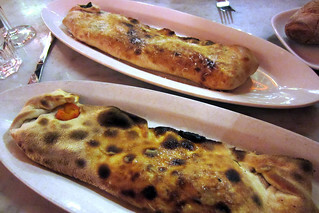 Calzones and liquorice cheesecake at Calzone’s, North Beach. We walked back with a very light sprinkle of rain which eased off quickly. The Golden Gate Bakery in Chinatown which we’d passed yesterday with a queue of about forty people outside it was still open, and had no queue, although there were three or four customers inside. Seeing how popular this place was, I decided I had to try a moon cake from there for the recent Chinese New Year. I got a lotus seed cake, which I will probably eat tomorrow. Back at the hotel we showered and then turned in for the night. I need to be bright and early tomorrow for the start of the conference! We are on board flight UA870 from Sydney to San Francisco. We left on time at 16:20 on Saturday, and it’s now a few hours into the flight, but at our destination it has just passed midnight on the same day. We are scheduled to arrive at 10:30 in the morning. It’s been a fairly eventless day so far. We got up, finished packing, then took a taxi to the airport around 13:00. Check in was quick, and we’d paid in advance for exit row seats for the extra leg room, which is serving us well right now as we relax into the long haul. Through customs and into the departure lounge we headed first to the Chinese restaurant where we had some steamed buns and dumplings for lunch. Then we browsed the shops a bit, buying an eye mask for M. and a toothbrush for me (that’s the item I accidentally left behind this time). We saw Quan from my work briefly near the gate, and arranged to meet at the baggage claim at San Francisco airport so we can catch BART together to our hotel. We boarded the plane and settled into our seats. They started showing the first movie almost immediately. M.’s vege meal came early and she said it was good – rice with a spicy lentil dhal. I had a choice of chicken or pasta with “red sauce”. I chose the chicken, which had a teriyaki style sauce with rice and vegetables. It was okay. After the meal service had cleaned up, a group of three fairly loud Americans came and stood in the area in front of our seats, nursing drinks and obviously settling in for a long flight of consuming alcohol. One older woman was carrying a little bottle of scotch or something, and they were all swapping stories about how drunk they’d got on other flights or something. Thankfully after a while a flight attendant came and told them to go back to their seats. We’re sitting on the tarmac at San Francisco airport,waiting for a gate to become vacant. We arrived 20 minutes early and should still be at the gate early. The sun is shining brightly and it looks like a beautiful day outside. The flight passed with only a bit of turbulence to break it up. Breakfast was an egg dish with corn kernels in it, or a plate of fruit. 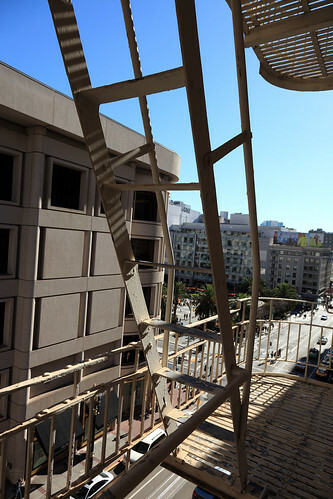 View from the Chancellor Hotel towards Union Square. We are resting for a little after returning to our hotel and having a shower after a full afternoon out and about. The plane eventually made it into the gate and we disembarked, then walked the long corridor to the customs hall. The queues were not long and we passed through fairly quickly, then waited a few minutes to gather our bags. We had them before we spotted Quan arriving a few minutes later. He grabbed his bag quickly too and then we walked out to the arrivals area and to the BART station to catch a train into the centre of the city. There was a train waiting there as we arrived, but we weren’t fast enough buying tickets to get on. Thankfully the next train was only a six minute wait and we piled on and grabbed seats. We chatted a bit about the conference and our previous visits to San Francisco with Quan as the train took us to Powell St, where we got off. Quan had a reservation at the Hilton, where the conference is, while we are staying in the Chancellor Hotel, a couple of blocks away. We separated and went to our hotels. We checked into a room on the fifth floor, looking out on to Powell St. We simply dropped our things, washed our faces, and then headed out for a brisk walk to keep ourselves awake. We left the hotel about 12:30 and headed over to Grant Avenue and walked north through Chinatown and North Beach towards Fisherman’s Wharf. It took us about an hour to get there, then we looked around the seafood eateries there and strolled along the Embarcadero towards Pier 39. The first stop there was the Boudin Bakery for some late lunch. We had the soup in sourdough bowls: M. having the tomato while I had the clam chowder. As usual, the first meal off the plane was delicious. We are back at the hotel after dinner and going to retire for the night soon. Earlier, after lunch we browsed the shops at Pier 39, checking out the various touristy goodness, including such marvels as Magnetron (a fridge magnet shop), a couple of chocolate and taffy shops, and the San Francisco 49ers sports gear shop (which also had Giants stuff and lots of other teams too). In the shop signing autographs was the retired 49ers player Bubba Paris, though we didn’t get anything signed. 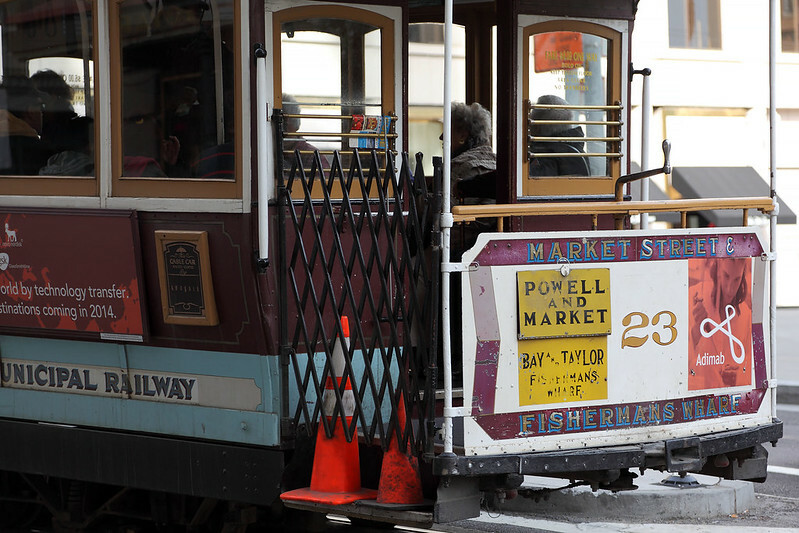 Then we hopped on a streetcar to take us down the Embarcadero to the Ferry Building. The open air craft market on Market St was still open with a couple of dozen stalls showing off various wares, so we had a look at that. M. bought a cool floppy hat from a woman with a stall full of hand crafted hats. We looked for the fridge magnet woman who sold me the broccoli magnet three years ago, but she wasn’t there. After that we crossed the road to go into the Ferry Building, where M. had a coffee from Peet’s. Next we explored the various cool food shops in the building, spotting a funky looking wine bar which we might try for a lunch snack one day. It was about 17:00 by this time and the sun was setting, so we walked up Market St back to our hotel, where we showered and changed to freshen up. About 18:30 we left to find dinner. I mentioned the Thai place I’d been to three years ago, and M. said she felt like Thai food. So I found the name and address: King of Thai Noodle House on O’Farrell St, just a short walk from our hotel. On the way out of the hotel we asked the receptionist about nearby supermarkets, and she said there was a Walgreens two blocks down on Powell St, also right near the Thai place. So we walked down, located the Walgreens, then went into the Noodle House. There was a queue of people waiting for a table, but the first group quickly got a table and then the group in front of us was three people but the next table they had was for two, so we got in next. Our table was upstairs, in a room painted entirely purple. M. ordered a vegetarian rice dish, pad gra praw, while I got the deep fried salmon with red curry that I’d enjoyed so much last time I was there. We also got a serve of vegetable egg rolls for a starter. 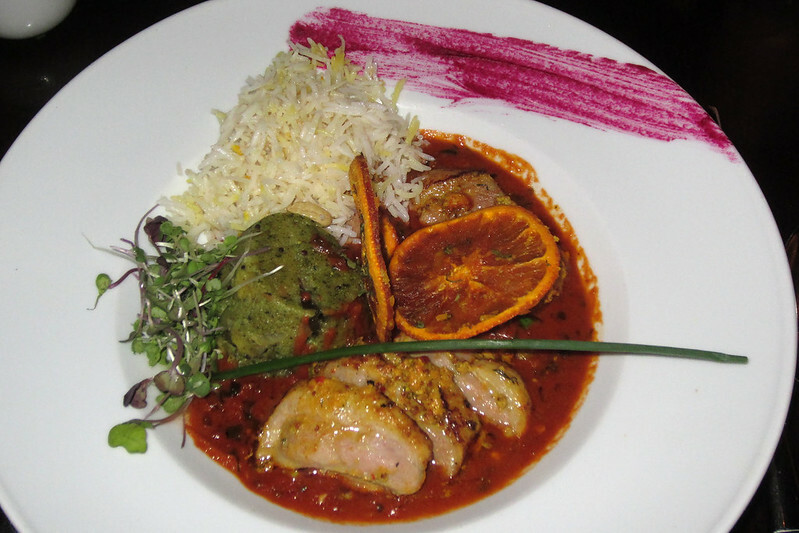 The food was awesomely good, and very satisfying after a long, tiring day. 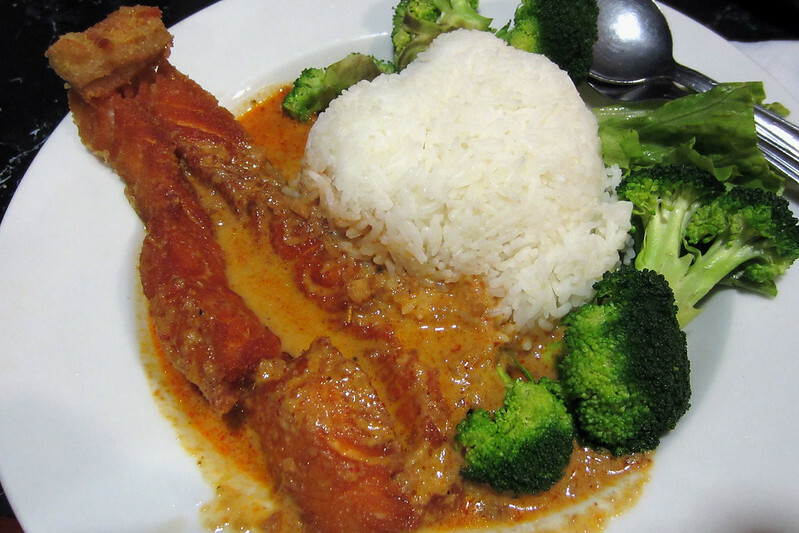 Deep fried salmon curry from King of Thai Noodle House. On the way back, M. was keen to take a look at the Levi’s store on Market St, so we walked around the block past that. We went in since it was still open, and they were having a huge sale. M. bought a pair of jeans for $30 and I got a shirt for $20. We were in different change rooms at the same time and when I came out with the shirt on I had no idea where M. was. A lady on the staff asked if I needed help and I said, “I don’t know where my wife is… She’s in one of these rooms.” She asked me her name, and I told her, and she started calling out! M. responded, so then we had it sorted. After Levi’s, we went into another Walgreens next door, different to the one we’d located before dinner. We bought some Grape Nuts and milk for breakfast in our hotel room, and some of the Old Spice deodorants for Andrew, who wanted some of the fragrances not available in Australia. Then we came back to our hotel, took care of some catching up on the Internet, and turned in for the night. We have an alarm set to wake us up at 07:30, if we’re not awake by then.